It occurred to me last Saturday that I've never formally introduced my family on this blog. 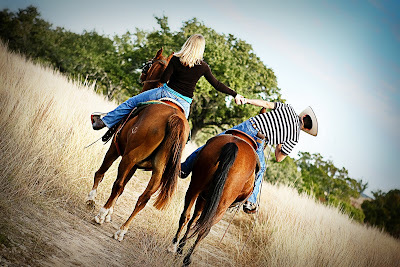 I have a sweet, manly, cowboy husband named Josh, and we have two horses, Taz and Spiderman, and a dog, Jolie. 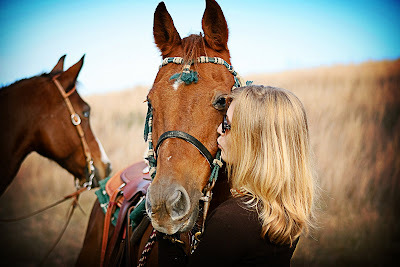 Taz has been Josh's horse all of his 14 years, and Spiderman has been my horse for 2 years now. He's the one I'm kissing in the picture. Neither are perfect, but we still love them. Josh has won 1st place at 2 playdays (for non-horse people, those are informal rodeos that include only speed events, such as barrel racing) on my horse, Spiderman! I'm working up the courage to go as fast as he does. I've only been riding regularly for 3 years compared to Josh's lifetime legacy. 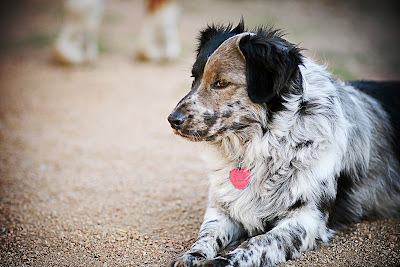 I adopted Jolie from the pound in Athens, TX, and we think that she's an Australian shepherd. Her metabolism is as fast as cold molasses, so she stays large year round, no matter how much we feed her. I had once convinced myself that she only APPEARED large because of her fluffy hair, but this past summer when we shaved her, the hair theory went out the window. 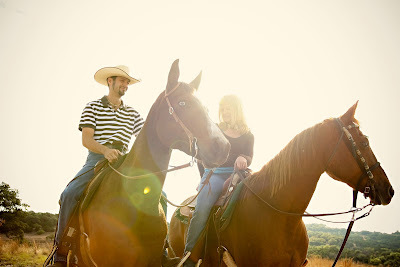 Here are some pictures of us taken by friends Nhi and Thao (www.huyennhi.com)()and www.thaodtran.com in Marble Falls this past November. I REALLY love their work!